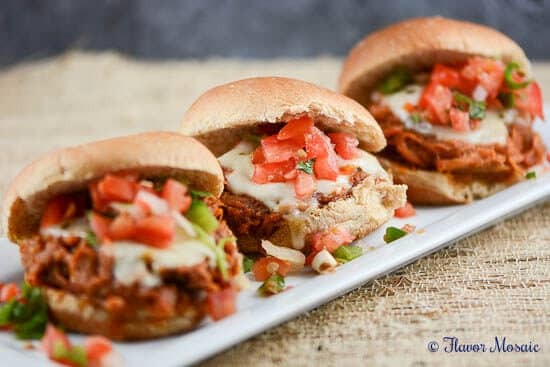 Chipotle Lime Chicken Fajita Sliders are super flavorful, spicy, cheesy little sandwiches that are perfect game day food for your tailgating or “homegating” party! This weekend is not only Labor Day, it is is the first day of both college and pro football season, and Mr. Flavor Mosaic is super excited!! Today he went to several tailgating parties before the Texas A&M game. Unfortunately, I couldn’t go because I had to write this Chipotle Lime Chicken Fajita Sliders post for you! See the sacrifices I make for you? 😉 I know. I know. Get out the 1000 tiny violins for me. Actually, since I am a foodie, I would really rather have a little cheese with my whine! In Texas, fajitas and game day go together like macaroni and cheese, or bacon and eggs, or chips & salsa. Someone, please stop me! In other words, fajitas have become a game day tradition. Since my husband went to the school that makes a tradition out of everything, I felt that I had to proudly carry on that tradition but put my own spin on it. Therefore, instead of regular fajitas, I created these Chipotle Lime Chicken Fajita Sliders and cooked the fajitas in the slow cooker. I just like to do things my way. 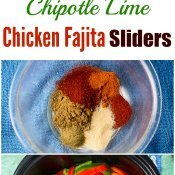 These Chipotle Lime Chicken Fajita Sliders may sound difficult to make but they really are easy, especially when I use the slow cooker. 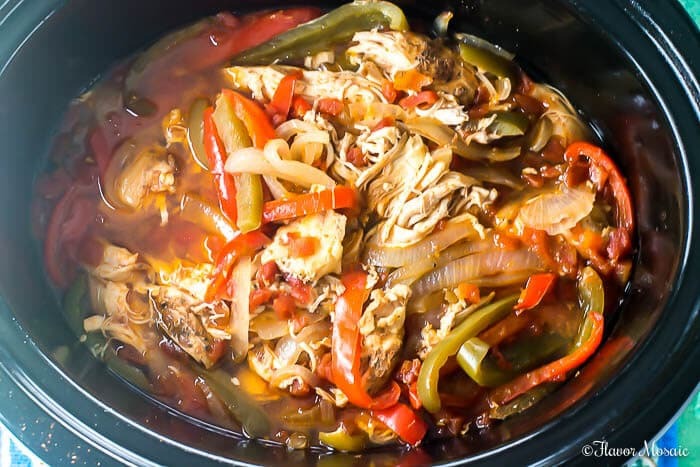 Place the chicken in the slow cooker. Sprinkle the chicken with the fajita seasoning. Add the onions and red and green bell peppers. Then add the tomato sauce, lime juice, diced chipotle chilies, and drained diced tomatoes and chilies. Cook the chicken on high for 4 hours or on low for 6 to 8 hours. Then shred the chicken and place it back in the slow cooker. Then it is time to assemble your Chipotle Lime Chicken Fajita Sliders. Place the bottom halves of the rolls in baking dish. 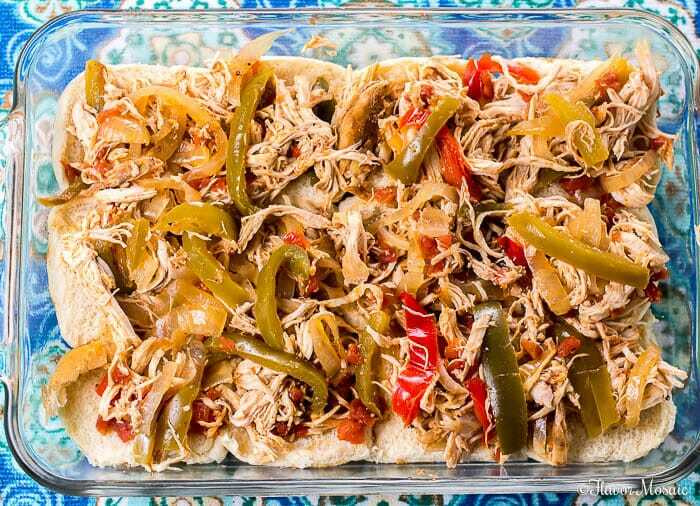 Spread the Chipotle Lime Chicken Fajita meat on top of the rolls. Place the slices of cheddar jalapeno or pepper jack cheese on top of your Chipotle Lime Chicken Fajita Sliders. Top with the other halves of the rolls. 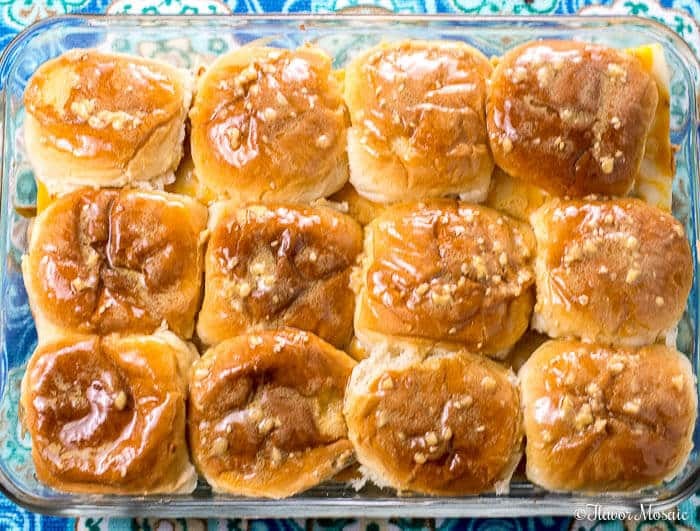 Then mix together the melted butter, dijon mustard, Worcestershire, and garlic, and brush that mixture over the top of the Chipotle Lime Chicken Fajita Sliders. 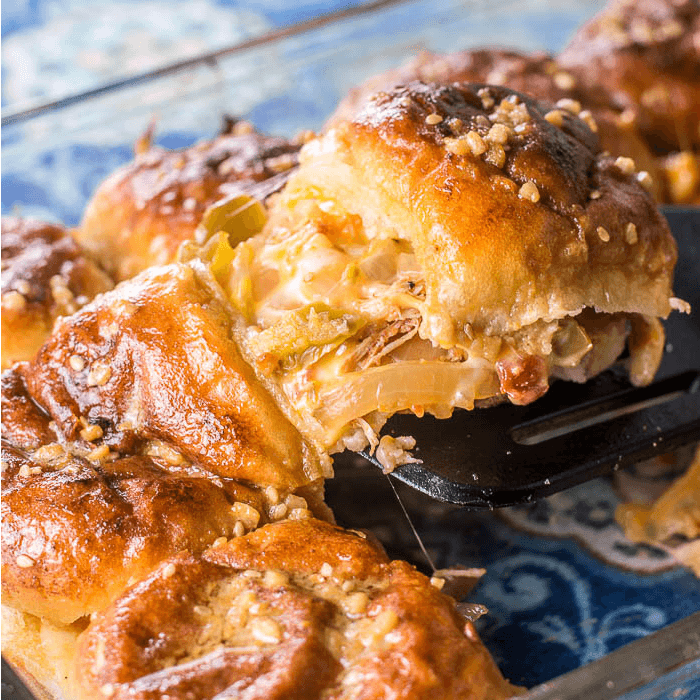 Then bake the Chipotle Lime Chicken Fajita Sliders in a 350-degree oven for 15 to 20 minutes to let the magic happen! You know what I mean. 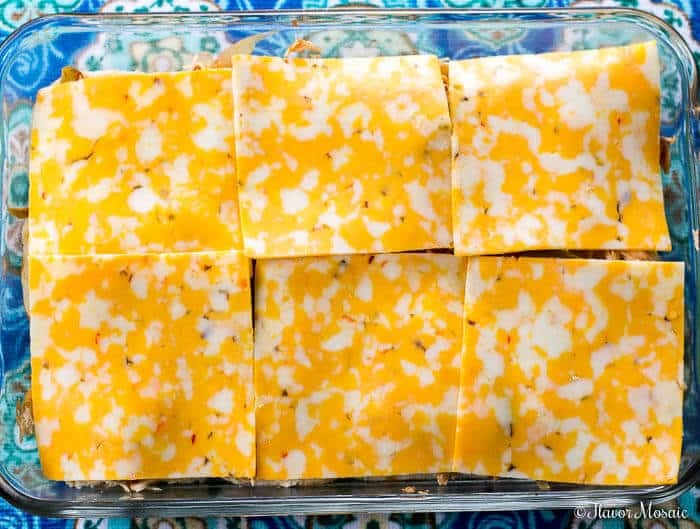 The cheese melts and the tops become golden brown. One tip to keep the tops from getting over cooked is to cover the pan with foil before you put it in the oven. Then half way through, remove the foil and return to the oven to cook uncovered for the remainder of the time. 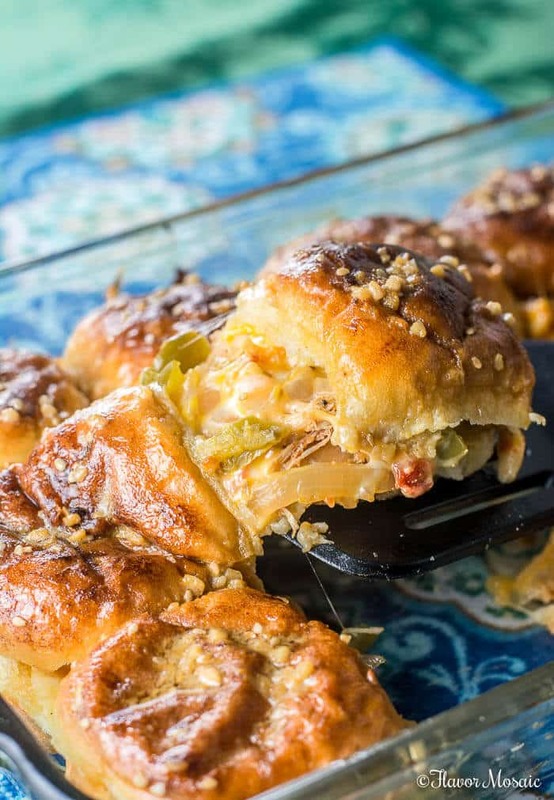 Next time you are watching the big game, or are hosting a tailgating party, be sure to make some of these Chipotle Lime Chicken Fajita Sliders because they will be the hit of the party. Try them and come back to visit here and leave a comment to let us know how much you liked them. Place 4 large chicken breasts on a slow cooker. 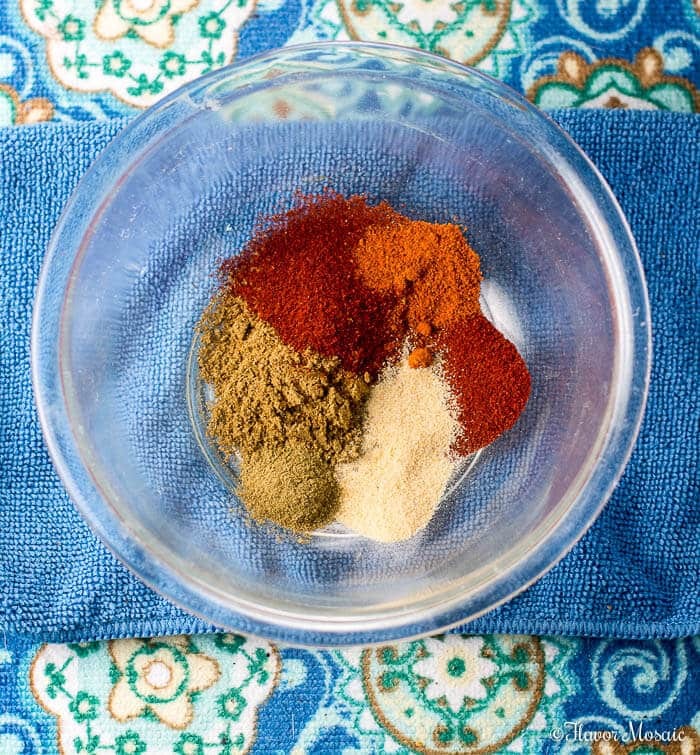 In a small bowl, mix together the ingredients to make the fajita seasoning mix. 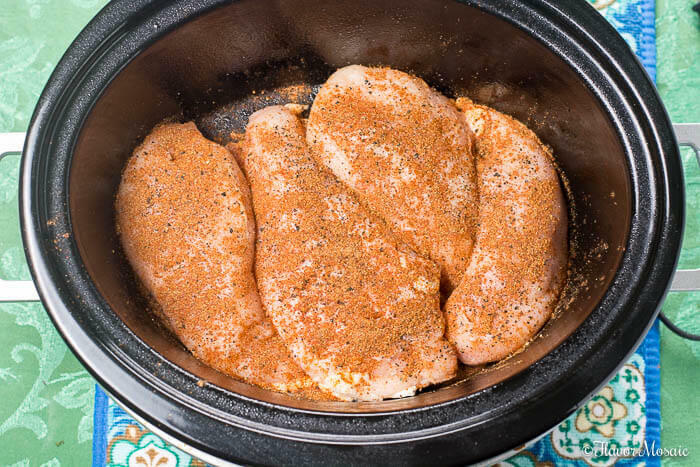 Sprinkle seasoning over both sides of the chicken breasts in the slow cooker. Add the sliced onions and red and green bell peppers on top of the chicken. Pour in the tomato sauce, lime juice, chipotle chiles, and diced tomatoes and chiles. Cook on high for 4 hours or low for 6 - 8 hours. Using two forks, shred the chicken breasts and stir thoroughly in the slow cooker. 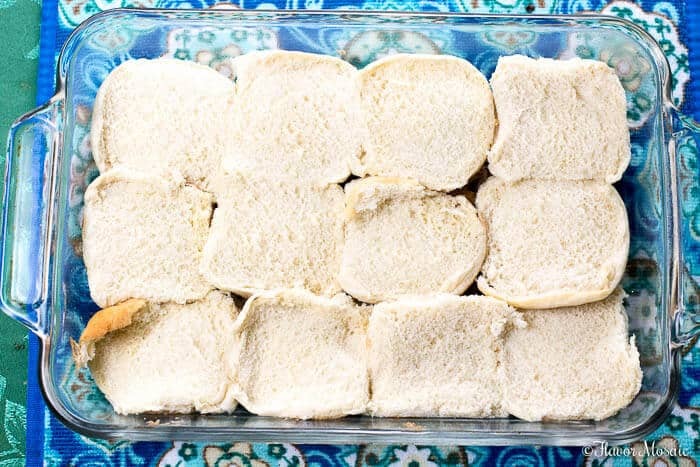 In a 9 x 13 baking pan, place the bottom half of the rolls, cut side up, into the bottom of the pan. Layer the Chipotle Lime Fajita Chicken and vegetables on top of the rolls. Then place the slices of cheese on top of the chicken to cover everything. Then top with the other half of the rolls. In a small bowl, stir together the melted butter, dijon mustard, Worcestershire, and minced garlic. Brush on the melted butter mixture on top of the rolls. 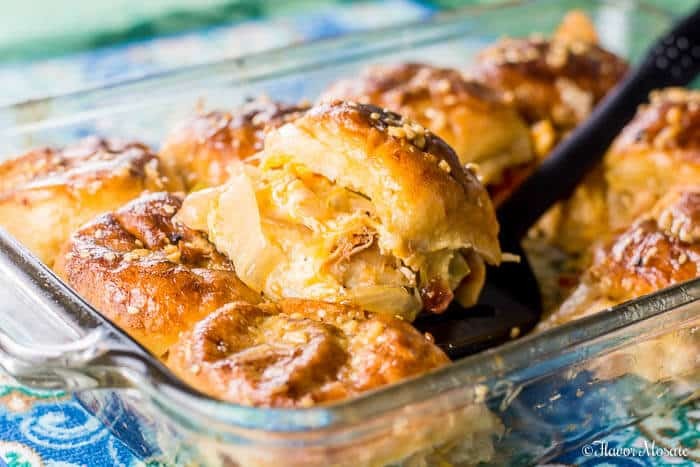 If you like this recipe be sure to check out these other Flavor Mosaic recipes! 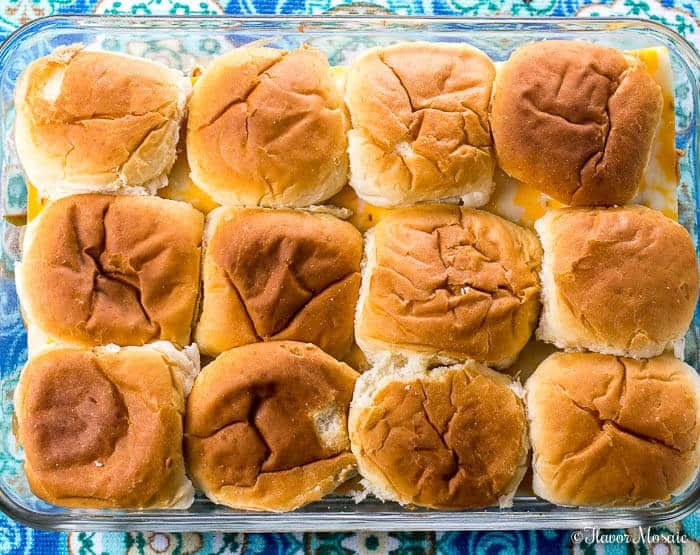 Everything about these sliders screams, “football!”, and I love that they’re fajitas – yum! 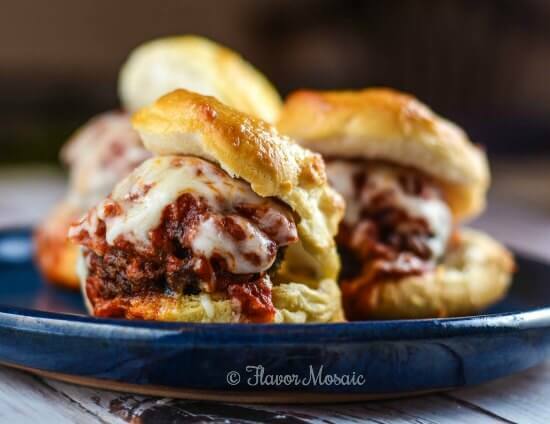 Love the flavors in these – a fun idea! These look AMAZING. All that melty cheesy goodness and oh those flavors! SO yum! 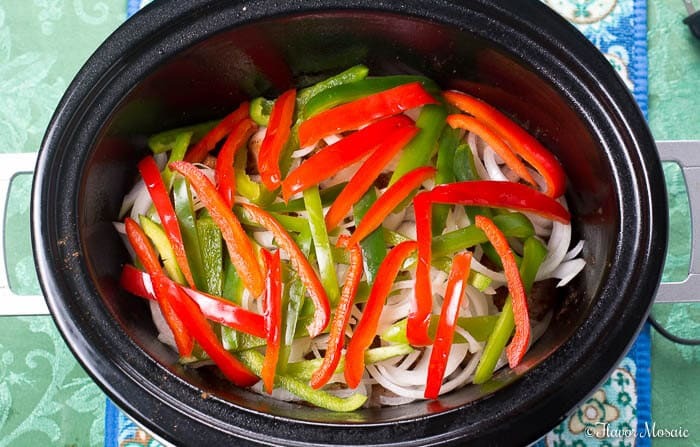 I love slow cooker recipes and I am going to try these and let you know what I think. Thanks. 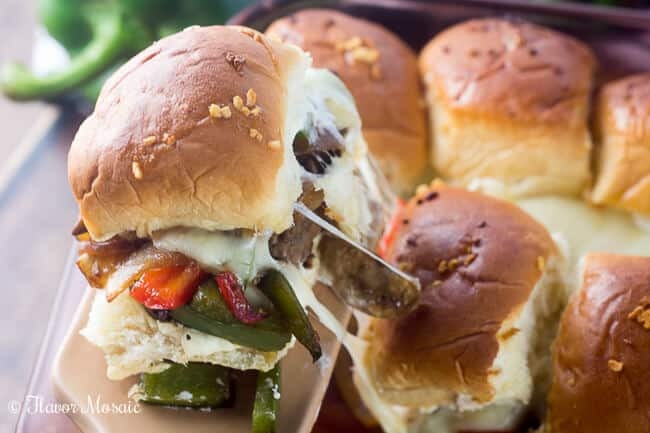 I adore fajitas so these cheesy fajita sliders look amazing!! !